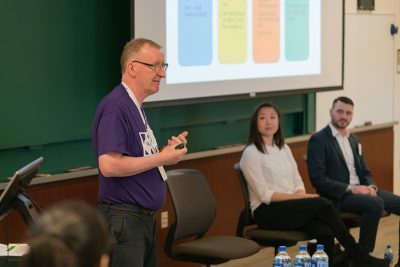 The Questrom School of Business is often quiet and calm on weekends, but the building filled with over 150 students and alumni who came to attend [email protected]’s first annual IDEA Conference Saturday. [email protected] created the event with the purpose of encouraging students’ creativity while teaching them about how to turn ideas into a reality. The speakers at the conference ranged from established entrepreneurs and innovators to local Boston University students with their own clubs. Formed in November, [email protected] is a university initiative meant to assist undergraduate and graduate students in developing their ideas. Located across from Marsh Chapel, [email protected]’s hub of operations is the BUild Lab IDG Capital Student Innovation Center, which opened in February. Blake Sims, program director of social innovation at [email protected], said the BUild Lab has had a successful couple of months, especially considering how young the organization is. “We’ve been open for two and a half months, and we’ve had thousands of students and faculty and staff come through,” Sims said. Over that period, Sims said the BUild Lab has hosted over 70 events including collaborations with student organizations. “It’s been a whirlwind of two months being open, and it’s been great connecting with so many students from across the campus,” she said. The program held the conference to help encourage camaraderie and support between BU students who innovate. She said she was hopeful that students made connections with resources who could aid them in their endeavors during the conference. Nikita Arora, a freshman in the School of Public Health, said she felt the IDEA Conference helped her formulate some new ideas. Bharathi Gandi, a freshman in SPH, shared a similar sentiment. “I have a couple of ideas on the backburner that I haven’t thought about in a couple of years … and I acquired some tools today that I’m going to go think about,” she said. They both said they agreed that Johnny Earle’s was one of the best parts of the conference. “I wish we had something like this when I was a student,” he said.